Texture, colour and bold prints were paramount to 28-year-old van der Horst’s Central Saint Martins graduate collection. Models emerged wearing bright nylon petticoats layered over Hawaiian shirts to form skirts, shorts and cape-like jackets. The prints themselves were something of a masterpiece; making Hawaiian sophisticated is no small feat but van der Horst pulled it off in clean, streamlined silhouettes. Unlike many of the summer resort collections, he approached the collection with a sense of humor and a desire to rescue the audience with sartorial escapism. 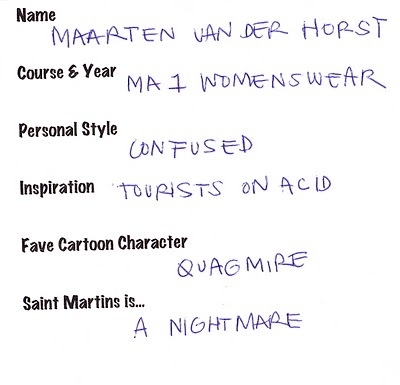 Where did you study prior to Central Saint Martins?I did my BA in Arnhem, in the Netherlands. It was great because it is a secluded little city in the middle of a national forest and there is absolutely nothing to do besides the fun things you get to do when you’re an art student. What was the inspiration for your MA collection?The central idea of the collection was taking an archetypical garment and dragifying it on a very low budget. Inspired by The Cockettes and the drag queen Divine, I came up with the idea of using second-hand nylon petticoats and appliquéing them onto Hawaiian shirts, Bermuda shorts and Capri trousers. It is all part of a ‘holiday wardrobe’, which together with the transvestitism echoes the theme of escapism. What were the references for the prints and the use of layered fabrics? The use of Hawaiian shirts and its prints is a reference to escapism, exoticism and going on holiday. Also, I like the sexual ambiguity of Hawaiian Shirts. It’s a play on the so-called ‘Boyfriend jacket’ that has been so fashionable. Yet, this version is more a ‘Big fat Western tourist in Bangkok’ jacket. The print itself is based on original Hawaiian prints from the 1940s. The nylon petticoats reminded me of Tao or Comme des Garçons, are you influenced by these Japanese designers? Obviously as a young fashion designer I am influenced by the anti-establishment spirit that Comme des Garçons has always represented. I also think it’s the duty of any young designer to at least try to be subversive. The use of second-hand nylon petticoats were inspired by John Waters and the Dreamlanders and how they used to steal from San Francisco’s vintage shops to create their outfits on a very low budget. Needless to say, I’m a huge John Waters fan and I am always on a very, very low budget. What inspires you? I always spend a lot of time in the library researching, for my own work, but also for other labels. My own ideas develop by making, doing, trying and testing. I’m very hands-on and I hate thinking about stuff too much. Even though there are a lot of references that I use to explain the choices I’ve made, most of all I want my clothes to be light-hearted and fun, but straightforward. What else are you working on at the moment? I’m starting my own studio, developing prints, fabrics. I am also starting on making furniture, so that’s very exciting! SCHOOL IS SUCH A NIGHTMARE!!!!!!!!!!!!! Come to his website ""'www.maartenvanderhorst.com"""for more surprise, his tumblr is great too.